The checkered flag flew none too soon for Indiana’s Tracy Hines in Saturday night’s 19th Annual O’Reilly Chili Bowl Midget Nationals 50-lap championship finale at Tulsa Expo Raceway, as he held on in the final laps to post a slim victory over Cory Kruseman and Dave Darland. With a Mopar powerplant plugged into the Wilke-Pak Kwik-Change No. 11 Spike Chassis, Hines picked up an extra $10,000 bonus from Mopar to go along with his first Golden Driller. After winning Thursday night’s Love’s Travel Stops & Country Stores Qualifying event, Hines drew the pole position for Saturday’s championship feature, with Wednesday’s Creek Nation Casino Qualifying Showdown winner Josh Ford drawing the outside front row. Friday winner and defending race champion Kruseman drew the second row inside, with Friday runner-up P.J. Jones to his outside. Hines gunned into the lead at the drop of the green flag and, following a brief lap two caution for Casey Shuman’s damaged racer, immediately began to separate himself from the field as Ford held off Kruseman, Jones and Chad DeSelle for second in the early rounds. “You’re trying just as hard as you possibly can, nobody goes out there and drives 90% because they want to finish second, but I’ll tell you there’s probably 240-something other people who’d like to be second right now so you’ve got to be pretty honored,” Kruseman stated in the post-race press conference. “Every time Tracy comes here he’s been extremely fast and had absolutely horrible luck, I was just hoping that was gonna take place again,” Kruseman joked. While the Wilke-Pak Motorsports team celebrated its first ever Chili Bowl victory, Darland’s third place finish aboard the Wilke-Pak Mopar-powered No. 11w Stealth was icing on the cake for the long-time Chili Bowl contenders. Ford earned an impressive fourth place finish aboard the Keith Kunz Motorsports Fontana-powered No. 73 Bullet, while ARDC champion Ray Bull made a strong charge from 13th to round out the top five in the MEGA Motorsports Gaerte-powered No. 22m Stealth. 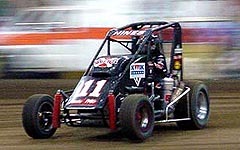 New Zealand Midget champion Michael Pickens raced from 19th to sixth to snare 2005 Chili Bowl Rookie of the Year honors. 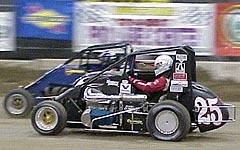 Jones crossed the stripe in seventh, with USAC Midget champion Bobby East in eighth. DIRT Modified/Late Model crossover standout Tim McCreadie made his first Midget outing a success by racing from 18th to ninth, with Brian Gerster advancing from 17th to complete the top ten. In addition to Pickens and McCreadie, other rookies making Saturday night’s starting grid included 15th-place finisher Tyler Walker and Shuman, the race’s first casualty. 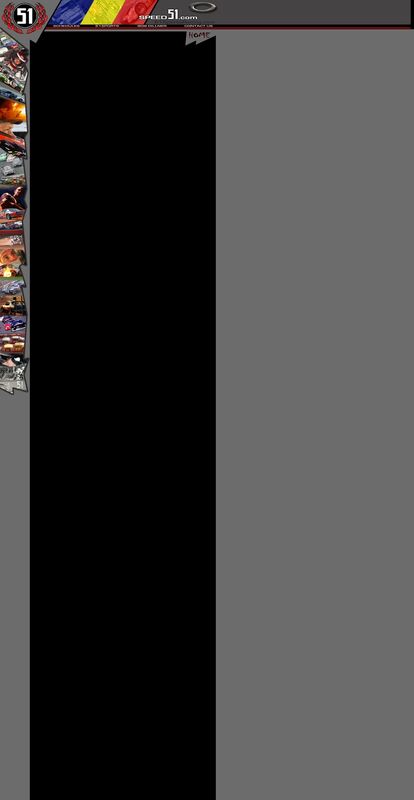 A record 249 entries competed in the 19th edition of the O’Reilly Chili Bowl Midget Nationals. With the larger than expected car count, the anticipated dashes for late model drivers and the lady racers were cancelled due to time constraints. Kruseman relegated Ford to third on the sixth round but trailed Hines by nearly a straightaway after ten laps, as seventh-starter Darland moved past Jones for fourth on the eleventh lap. Hines was just encountering lapped traffic when the race’s next caution flew after twelve circuits for Tony Stewart, who spun to a halt in turn one after contact while dicing for seventh. Stewart would exit with suspension damage two laps later. Hines took off again on the restart as Kruseman held off the battling duo of Ford and Darland for second. The race’s third and final caution appeared after 19 circuits when Bud Kaeding, Jon Stanbrough and Gary Wright tangled in turn four. All three rejoined the chase at the tail. While Hines appeared to be on the way to a dominating victory in the early stages, the prestigious event turned into a nail biter in the late rounds as Hines' inability to successfully navigate lapped traffic left the door open for his pursuers that dashed through traffic with ease. In the end, Hines took the checkered flag less than two car-lengths ahead of two-time Chili Bowl champion Kruseman, with a fast-closing Darland taking the show position just a car-length behind Kruseman. The final 31 laps were run in non-stop fashion, with Hines amassing a ten car-length advantage over Kruseman by the 25th round to claim the Weld Racing Midway Bonus. When lapped traffic came into play Kruseman began to chip away at that advantage, as Ford and Darland swapped the third spot several times. Kruseman closed to within two car-lengths of Hines and kept the pressure on the rest of the way. As the leaders navigated through heavy lapped traffic, Kruseman made several bids for the lead, but to no avail. Meanwhile, Darland finally assumed command of the third position from Ford on the 42nd lap and set his sights on the lead duo. Darland quickly began reeling the pair in and had just put himself within striking distance as the checkered flag flew upon Hines, who had both Kruseman and Darland nipping at his heels. Denied the chance to become the first back-to-back winner in the history of the O’Reilly Chili Bowl Midget Nationals, Kruseman settled for the runner-up slot aboard the Bondio Fabrication/Barnes Oil Pumps No. 47 machine.